Vaseline has gone live with a new campaign for its Total Moisture Body Lotion variant. The ‘Zindagi Ready Hoon Main’ TV commercial is very average in concept and execution, nothing we haven’t seen before. The TVC does have a decent track though, which HUL leverages successfully on Facebook through an innovative Video Karaoke application and contest. The idea is great. 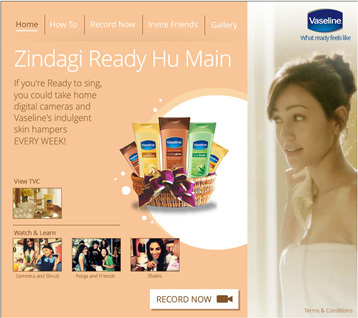 Fans are required to record a Video Karaoke of the Vaseline TV ad jingle using their PC webcam and microphone. In case they don’t want to use the webcam or don’t have one, they have the option of selecting a few pictures from their Facebook album or the ones provided by Vaseline and record the jingle and upload. Select participants stand a chance to win weekly Vaseline skin hampers and digital cameras. The TV Commercial and pre-recorded Karaoke videos have been uploaded to guide participants. The contest flow is good, the recording app works fabulously and the detailed ‘How To’s’ help. What I thought could have been better is the overall quality of the creative, which seems a tad pixelated. The copy on the app could also do with a quick QC.